Many thanks for yours of December 6th. Also for previous cards etc. & your many kind wishes. Am very happy to note that you like our comedies so well & certainly appreciate your support towards our success. FIRST: That the said second. party does hereby agree to render services as an actor in, and director of, photoplays and as a writer of stories and scenarios; it being understood that such services, whether as such writer, director or actor, are to be rendered by the second party in photoplays, whether those being produced by the first party or by persons with whom the first party may enter into agreements from time to time for the rendition of services by the second party as aforesaid, such services to be rendered by said second party in any such capacity at the instance and request of the first party for and during the term of five (5) years, commencing on the 23d. day of December, 1929, and ending on the 22nd day of December, 1934, it being understood that the second party will faithfully and to the best of his ability perform such services as such actor, director and writer as aforesaid. It is understood that the term "photoplay", as used in this agreement, shall be deemed to include but not to be limited to motion picture productions produced, or exhibited with sound and/or voice recording, reproducing and all sound devices, radio devices and all other improvements or devices which are now or may hereafter be used in connection with the production and/or exhibition and/or transmission of any present or future kind of motion picture production. SECOND: The second party agrees that during the life of this agreement he will devote his entire time and attention exclusively to the services of the first :party, and will perform the services above specified, and all services incidental and associated therewith, at such times and places as the first party may from time to time direct; that he will confirm to such reasonable rules and regulations as said first party may from time to time prescribe for the conduct of its Studios, and to the regulations of such other Studios in which he may be performing under the terms hereof, and that he will report for duty promptly when called or directed for work by said first party, as herein contained. THIRD: The said second party further agrees, in consideration of the premises and of the advertising and publicity which he will receive through the release of films produced by the first party, that he, the said second party, will not, during the continuance of this agreement, appear in, direct, write, produce, or assist in producing any motion picture, photoplay, scenario, or film for any motion picture producer, or otherwise, or in any other manner engage in or assist others in any branch of the motion picture business or profession, or appear or in anywise assist in the production of any play, drama or other production upon any stage, or in any public or private performance, lecture, or entertainment, or take part in any radio program, broadcast or entertainment, except with the written consent of the first party; and the said second party does hereby acknowledge that his talent is unique and of a peculiar and extraordinary nature and character, and of peculiar value to the first party, and that his talents and services cannot be replaced by the first party. The second party hereby grants to the first party the privilege of publicity in advertising him in connection with all the photoplays in the production of which the said second party may take part under the terms hereof. FOURTH: The second party expressly gives and grants to the first party the sole and exclusive right to photograph any and all of his acts, poses, plays, and appearances of any and all kinds, and the right to record and/or reproduce his voice and all instrumental and/or musical and/or other sound effects of any and all kinds during the term hereof, and to produce or reproduce the same by any method whether now known or not, and the first party shall have the exclusive and complete control, right, title and property and the right of copyright in and to all the foregoing things, and any and all parts thereof, as well as in and. to the name of the second party for any of such purposes during the term hereof and perpetually in connection with all productions in which the second party appears under the provisions hereof, as fully and completely and to all intents and purposes, as the second party could or would have enjoyed the same in the absence of this agreement. It is understood and agreed that the second party will not transfer or attempt to transfer any right, title or interest in and to any of the things above specified. FIFTH: It is particularly understood that the right is also hereby granted to the first party, or whomsoever said first party may contract with from time to time, as herein provided, to make and reproduce and make and distribute a reproduction of the voice, singing or instrumental music made or produced by the second party, separate and apart from any photographic reproduction, and that such sound effects and/or voice and/or singing and/or instrumental music produced or made by the second party, and/or other sound effects may be made without photography, and for the production of such sound effects alone, whether by the first party or by such other party or parties as the first party may from time to time contract or agree with, and all of the rights herein contained shall fully inure to the first party and such other parties to cover and include such separate production of sound or sounds as herein provided, and the sound or sounds may be recorded and used for duplication and commercial records not synchronized with any photoplays or the sale or exhibition of such photoplays. SIXTH: The second party hereby grants to the first party during the term hereof the sole and exclusive right to make use of his name for advertising, commercial and/or publicity purposes, as well as the sole and exclusive right to make use of and distribute his pictures, photographs or other reproductions of his physical likeness. The second party shall at no time, during said term, grant the right to, authorize or willingly permit any person, firm or corporation, .other than first :party, to make use of his name or to make use of or distribute his pictures, photographs or other reproductions of his physical likeness, and authorizes the first party in the name of the second party, or otherwise, to institute any proper legal proceedings to prevent such acts or any of them. SEVENTH: It is understood and agreed that each year of the term hereof, that is, each of the following periods the period commencing December 23d, 1929, and ending December 22nd, 1930; the period commencing December 23d, 1930, and ending December 22nd, 1931, the period commencing December 23d, 1931, and ending December 22nd, 1932; the period commencing December 23d, 1932, and ending December 22nd, 1933, and the period commencing December 23d, 1933, and ending December 22nd, 1934, contemplates a minimum working period of 30 forty-eight weeks, the first party hereto being granted the right and privilege to suspend the production of such photoplays in which the services of said second party are to be used for a total period of four weeks in each year hereunder; such suspension periods being of such length and duration as said first party may decide upon from time to time. It is understood that the period of time herein provided of forty-eight weeks in each year hereunder is a minimum period and nothing herein contained shall abridge or limit the right of said first party to the use of the services of said second party for a greater number of weeks during each of said years. It is understood by and between the parties that such suspension periods shall be not less than a period of one week at any one time, and no particular form of notice shall be given by first party to avail itself of such term of suspension. It is regarded by both parties hereto that to properly exploit and promote the welfare of the second party, it is best that the services of said second party be used only at times and in photoplays which, in the discretion of the first party shall best promote that end, and therefore the aforesaid minimums have been arrived at by the parties hereto. EIGHTH: It is understood that, should the production of any photoplay in which the services of said second party are required be in progress at the expiration of the term of this agreement, or any prior termination hereof, the same shall be extended until such film is completed, or the work of the second party terminated in a manner satisfactory to the first party, but such extension shall not exceed two (2) weeks, and all the provisions of this agreement in effect at the expiration of said term shall be extended and remain in full force and effect during the extension provided for in this paragraph. It is understood that should retakes, either of action or sound, or both, be necessary after the expiration of said term, or after any prior termination, said second party shall, at the request of the first party, render services of the kind contemplated hereby in producing such retakes, and agrees to accept in full for such services payment for such days as such services are required at the rate of payment in effect hereunder at the termination of this agreement, it being understood, however, that all such retakes shall be completed within two (2) weeks following the termination of this agreement. The sum of fourteen hundred dollars ($1,400.00) per week, payable at the end of each week, during the period of the first year hereunder, commencing December 23d, 1929, and ending December 2Znd, 1930, except during the periods of suspension as provided for herein; the sum of nineteen hundred dollars ($1,900.00) per week, payable at the end of each week, during the period of the second year hereunder, commencing December 23d, 1930, and ending December 22nd, 1931, except during the periods of suspension as provided for herein; the sum of twenty-four hundred dollars ($2,400.00) per week payable at the end of each week, during the period of the third year hereunder, commencing December 23d, 1931, and ending December 22nd, 1932; except during the periods of suspension as provided for herein; the sum of twenty-nine hundred dollars ($2,900.00) per week payable. at the end of each week, during the period of the fourth year hereunder, commencing December 23d, 1932, and ending December 22nd, 1933, except during the periods of suspension as provided for herein; and the sum of thirty-four hundred dollars ($3,400.00) per week, payable at the end of each week, during the period of the fifth year hereunder, commencing December 23d, 1933, and ending December 22nd, 1934, except during the periods of suspension as provided for herein. TENTH: As a distinct and additional consideration to the second party for granting to the first party the exclusive and sole right to his services during the term of this agreement, and also as a special consideration from the first party for the privilege to the first party of terminating the employment of t he second party upon notice as hereinafter provided, the first party agrees to pay to the second party, at the end of each week during the term hereof, the sum of one hundred dollars ($100.00). ELEVENTH: In case the production or completion of photoplays by first party under the terms of this agreement shall be suspended without fault of the first party, by reason of any fire, casualty, strike, unavoidable accident, act of God, or by the enactment of any municipal, state, or federal ordinance or law, or by the issuance of any executive or Judicial order, whether municipal, state or federal, or by any other legally constituted authority, or by any unavoidable or unforeseen occurrence affecting the first party, then and in that event the obligations of each of the parties hereto under this agreement shall be suspended likewise, during the period of suspension, not exceeding four weeks during the term hereof, and the term of this agreement and all of its provisions herein contained shall be extended, at the option of the first party, for a period equivalent to the period of such suspension. TWELFTH: In the event that, by reason of mental or physical disability or otherwise, the second party shall be incapacitated from fully performing the terms or complying with each and all of his obligations hereunder, or in the event that he suffer any facial or physical disfigurement materially detracting from his appearance on the screen or interfering with his ability to per form properly the required services hereunder, then and thereupon this agreement shall be suspended both as to services and compensation, except the special compensation recited in paragraph tenth hereof, during the period of disability or incapacity, and the term of this agreement and all of its provisions herein contained shall be extended, at the option of the first party, for a period equivalent to the period of such suspension. THIRTEENTH: Should the first party at any time desire to terminate the employment of the second party under this agreement it is provided that the first party, having theretofore paid the special weekly compensation to enable it to terminate this agreement, shall have and is hereby given the privilege of terminating this agreement and the employment thereunder at any time upon its first giving to the second party sixty (60) days' notice of its intention to so terminate this agreement; and on the expiration of the time specified in said notice, this agreement and the employment thereunder and all compensation, of whatever nature, shall terminate and cease. FOURTEENTH: It is distinctly understood and agreed by and between the parties hereto that the services to be rendered by the second party under the terms hereof, and the rights and privileges granted to the first party by t he second party under the terms hereof are of a special, unique, unusual, extraordinary and intellectual character which gives them a peculiar value, the loss of which cannot be reasonably or adequately compensated in damages in an action at law, and that a breach by the second party of any of the provisions contained in this agreement will cause t he first party irreparable injury and damage; the second party hereby expressly agrees that the first party shall be entitled to injunctive and other equitable relief to prevent a breach of this agreement by the second party. This provision, however, shall not be construed as a waiver of any other rights that the first party may have in the premises, for damages or otherwise. FIFTEENTH: The first party is hereby granted by the second party during tile term hereof the sole and exclusive right to use his name for advertising or publicity purposes, as well as the sole and exclusive right to make use of' and distribute his pictures, photographs, sound records, or other reproduction of his physical likeness, sound, singing or music produced by him, and he will not do or permit to be done any act or acts inconsistent, in the opinion of the first party may, in the name of the second party, institute, continue and prosecute any proper legal proceeding to prevent violation of any act or acts contemplated hereunder. SIXTEENTH: The second party hereby expressly gives and grants to the first party the right to lend the services of the second party at any time and from time to time during said term, to any other person engaged in the production of photoplays, upon the distinct understanding and condition, however, that this contract shall nevertheless continue in full force and effect, and that the second party shall not be required to do any act or perform any services contrary to the provisions of this agreement. Any breach by any such person, however, shall not constitute a breach by the first party of its obligations and covenants under this agreement, but in the event of any such breach, the second party, at his option, shall be released from the obligation to render further services to such other person. In the event that the second party is required to render services for any other person as hereinabove provided, he agrees to render the same to the best of his ability. Should the second party perform services for any other person, such other person shall be entitled to the same incidental advertising and other rights in connection with the productions in which the second. party appears as is given to the first party under the terms of this agreement. EIGHTEENTH: It is understood that any scenarios, stories or material written or composed by the second party hereto shall be original material, and that the option of the first party hereto it may be copyrighted or priority thereof set forth by it either under the laws of t he State of California or the laws of the United States of America relating to such matters, under its own name or under the name of the second party hereto, who, however, shall execute such transfers and assignments thereof to the first party as such first party shall from time to time deem advisable, but that from time to time, at the request of the second party, the first party shall re-assign to the second party hereto all rights therein not necessary in the use or preservation thereof as motion picture theme or material in the production of motion pictures and photo plays, or uses incident thereto. IN WITNESS WHEREREOF, the first party has caused its corporate name and seal to be hereunto affixed by its officers hereunto duly authorized, and the said second party has hereunto set his hand, all the day and year first above written. To be paid only during working periods—that is, a minimum of 48 weeks during each year. (x) For our privilege of terminating contract upon 60 days notice to Laurel, we are to pay him an additional weekly sum of $100. during full term. Account fire, strike, or any unavoidable accident; agreement suspended and all obligations of all parties suspended for period of not exceeding 4 weeks during term of agreement. However, at our option we may extend term of agreement for period equivalent to period of such suspension. Our privilege to terminate contract upon 60 days notice to Laurel. We to be released from payment, in such event, of above compensations, except the weekly additional sum (x) above specified. We may at our option extend agreement for period equivalent to period of such incapacity. On account of retakes or uncompleted picture—not exceeding two weeks. We may sell or assign the contract in its entirety. Assignment and copyright of stories. KHJ, at 10:30 this morning on The Times Forum, will feature Glenn Hood, the Songbird of the Yosemite. In half an hour of song and music. “Glenn,” as he is known in the Yosemite, will play his Firefall medleys and take visitors to this beautiful playground back to its enchantment. At 4:30 this afternoon, Laurel and Hardy, Charley Chase, Our Gang and filmland’s other comedy stars will appear on the Voices or Filmland half-hour. Raymond Paige and his Don Lee Filmland Orchestra will help make this a real hit. 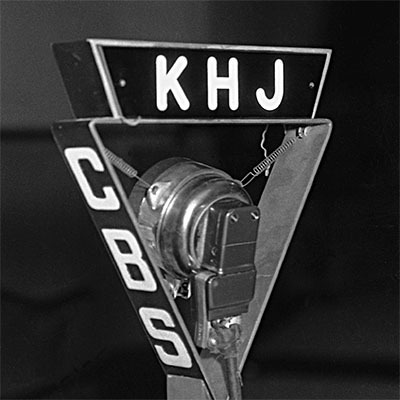 At 8 o’clock, KFRC through KHJ, will bring you the Blue Monday Jamboree—two hours of laughs and music. It will hold your dial—and how. World-wide news broadcast will be at 4:20 instead of 4:50 this afternoon only. The Screen: "The Rogue Song"
The Rogue Song with Lawrence Tibbett, Catherine Dale Owen, Nance O’Neil, Judith Vosselli, Ullrich Haupt, Elsa Alsen, Florence Lake, Lionel Belmore, Wallace MacDonald, Kate Price, H.A. Morgan, Burr MacIntosh, James Bradbury Jr., Stanley Laurel and Oliver Hardy, based on the operetta, “Gypsy Love,” by Franz Lehar, A.M. Willner and Robert Bodansky; directed by Lionel Barrymore. At the Astor Theatre. Lawrence Tibbett’s grand baritone voice filled the Astor Theatre last night as though more space were needed tor the volume of the grand opera singer’s debut in his first audible screen adventure, The Rogue Song, a Technicolor adaptation of Franz Lehar’s composition, “Gypsy Love.” It seemed as one sat in the orchestra seats that Mr. Tibbett might be heard throughout the length and breadth of Times Square, but it was none the less inspiring. Only in one of two places was Mr Tibbett’s singing too overwhelming, for the powers of the microphone, which, however, is something that can be remedied from the projection booth in forthcoming performances. When Mr. Tibbett sings, one cares not why, for the story, such as it is, takes second place in this film. The comedy of that clever team, Stanley Laurel and Oliver Hardy, may slip from quiet fun to slapstick, but, so long as you know that soon again Mr. Tibbett’s stentorian singing is to be heard, one laughs with the crowd. And so also during the commonplace passages of dialogues one is well aware that it will not be long before Mr. Tibbett is to sing again. And when his voice swells from the screen one forgets not only the trite lines and the farcical antics, but also that the singer himself is not on the stage. Never before have a singer’s efforts on the screen been applauded so genuinely. He has a sheikish air with him, has this opera singer. He fills his part well, and beauty is impersonated by Catherine Dale Owen, whose charms suffice for any picture, It is not a film to criticize adversely the excuse for a story, for to be able to listen to Mr. Tibbett sing is ample reward for sitting in one’s seat. It is, moreover, an audible picture in which the vocal sounds are finely synchronized. Mr. Tibbett is virtually the only one who sings, and as he happens to be a bandit in this film and one who sings as he is being lashed in the end, one becomes quite satisfied with his heroism. He is like a singing Fairbanks, who does not attempt Mr. Fairbanks’s sleight of foot. As Yegor, the Caucasian singing bandit, who garbs himself as a Cossack, Mr. Tibbett avails himself of any opportunity to rend the air with his melodious baritone voice, sometimes he chants of love, then of beauty, then of hate and also of hoped for revenge. Near a lake he sits with Princess Vera (Miss Owen) and warbles about “eight little fingers and two little thumbs.” At that instant he is in a conciliatory mood, for he has captured the Princess after throttling her brother. He ends the life of Vera’s brother because that rascal had deceived his (Yegor’s) sister. Yegor’s clan are known as the “robbing larks,” but Yegor is given a chance to show, that all women are not tempting to him. For instance, there is the Princess Alexandra, who finds Yegor so pleasing that without a word she offers him a string of pearls. He takes the pearls and leaves the matronly brunette in peace, much to her chagrin. She is, in fact, so peeved with Yegor’s conduct that she wishes to have him apprehended for stealing her jewels; but Yegor, until the climax, is a difficult fellow even for the Cossacks to capture. He may be attired in red or blue and he may sing of his joy or his anguish, but those who desire Yegor’s end are invariably discovered with a dagger in their own bosoms. There are scenes of the Thieves Market, others of palaces with highly polished floors. And from there one may go to grottoes, to mountainsides and through the chastening sands of a desert. They are all beautifully pictured in glowing Technicolor shades. On all sides one heard the audience remarking on the enchanting view before them. During those interludes when Mr. Tibbett lifted his powerful voice in song the audience sat in rapt admiration and when his melody ended there was applause. A second later Messrs. Laurel and Hardy were perceived delivering some of their comic antics, now and again beginning with a hush and a sense of restraint, but frequently culminating farcically, which provoked a wave of merriment. 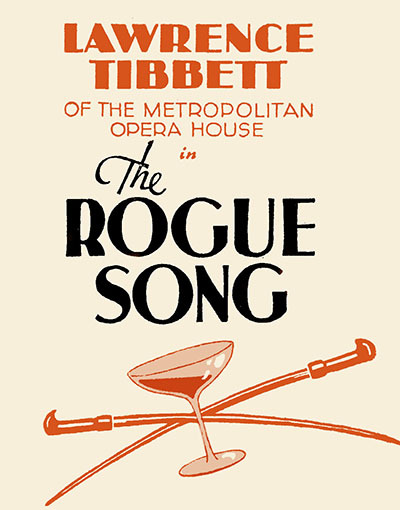 Among the songs rendered by Mr. Tibbett in this offering are “The Rogue Song,” “The Narrative” and “When I’m Looking For You.” The music of these renditions was composed by Herbert Stothart and the lyrics by Clifford Grey. Lionel Barrymore directed this subject, and considering its operatic action and scenic effects, he has done his task with good taste and imagination. The excuse for ballet interludes is that of having the performances held in Princess Alexandra’s handsome home. There are scenes with dancers directed by Albertina Rasch, but in this production it is emphatically the voice that shines over settings and story, and the voice is that of Mr. Tibbett.